[00:01:22] jpabq: stuartm: Very nice! [01:29:46] skd5aner: stuartm: for previews and channel icons, I agree with you that aspect ration should ALWAYS be preserved. There have been occasions in various themes and in mythweb where that wasn't the case (for channel icons) and boy does it look ugly! [02:46:10] jheizer: I just came across an interesting "issue" while working on my Gallery display. Doing a thumbnail image for a picture generates that thumbnail in the pictures directory. 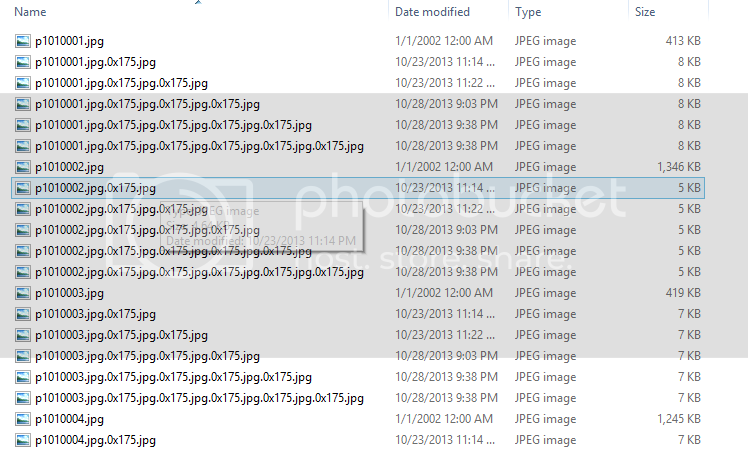 So the next GetFiles returns twice as many pictures and in turn generates twice a many thumbs. [02:49:28] jheizer: So I guess I raise the question of it the resized images best place mixed in with your actually pictures? [03:27:33] jheizer: I 100% agree. [03:28:03] jheizer: From my one night of developing the tabled gallery I have over 1000 thumbs generated. [11:55:55] stuartm: now that I've typed that out, it seems vaguely familar, as though this was raised at some point in the past? [11:58:00] stuartm: dblain: sorry, that should have been "we're NOT compressing"
[12:54:44] stichnot: stuartm: When I press INFO on a recording in the frontend, most of them say something like "5 of 136489312" for the Episode field. Not sure where this is coming from. [12:56:30] jheizer: stuartm, awesome on the tmp directory. [13:03:16] jheizer: The only thing I can quickly come up against is if those should be translated in the future. I'm not sure how universal HDTV is. [13:18:59] jheizer: I meant client side translated. Same time, too lazy to look up the numbers is most likely why I never included them. [13:19:51] jheizer: Though I am the wrong person to ask as my day job is all integers that then runtime translate to one of 8 languages. So I am use to playing with int values all day. [13:22:39] jheizer: Ugh, and I just got sent a WS spec that sends strings that I have to do actions based upon that are 2–3 words each. Those *should* be integers/enums. [13:24:59] jheizer: In the Myth case the strings are more fluff so I am down either way. This WS/interaction with this site I am lost on. I am pretty good with web stuff but they want me to send a user to them from my side sending cookies set not using domain level/cross domain cookies. How else does my site get the end user's cookies set... Seems like all the iframes and tricks break over time. [13:35:41] jheizer: As a client I'd assume I have to have a dictionary of terms to look up, but I totally get it from the conversion of mythweb. You are already there in that context, in English, and will be around a lot longer than any of us 3rd party. [13:36:36] jheizer: And I'll agree that most of the code is presentation. API made it stupid easy to have all the data you need ready to go. [13:36:48] jheizer: From mine end as well. [17:26:20] dblain: stuartm: re: enum names. I can think of a few ways to handle it. 1) the serializer can add both the name and value (works best with xml <element tc='0'>unknown</element>. Not sure how to make it work for json or other serialization types. [17:27:25] dblain: 2) can extend the wsdl support to allow for the complete list (name & value) of each enum be returned. A client side function would need to be created to parse that data to create a "GetName" type function. [17:27:45] dblain: 3) we can add service methods to do the "GetName" type functions. [17:27:53] dblain: Not sure which approach to take. [17:31:28] dblain: yeah, it wouldn't be approriate for a client side access, but would be most effecient for server side scripts. [17:32:40] jheizer: I use #1 a lot in xml as well but also agree I don't know the similar "standard" for that type of use in json. [17:35:28] dblain: Passing the name as the only value seems like it would be setting us up for problems if/when the name gets changed (it can be said the same issue exists with just passing a #). But I like human readable values to simplify end use. [17:35:55] dblain: So I'd say, if I had to pick one; serialize the name. [17:42:02] dblain: using Q_ENUM we get the help of Qt's introspection. [17:43:03] dblain: I won't have time to look at this for a few days to a week, so go with whatever approach you want and we can re-address it if we need something more generic. [17:43:25] jheizer: Does QT follow the .Net style of sending an enum value as the string over a service by default instead of the byte/int? [17:46:59] jheizer: I assumed in that regard, was more just curious in general. I guess that is the WSDL standard and it was a stupid question to begin with. [17:48:15] jheizer: Hmm, I thought it was string value only actually sent. I could be wrong. [17:48:48] jheizer: I know .Net makes wsdl services stupid easy, not as familiar with other platforms. [21:44:00] stichnot: stuartm: since you mentioned the preview generator, I've noticed that every time the PBB loads a preview image, the mythfrontend memory footprint increases by ~10MB. Eventually it runs out of memory and crashes. It could be something that exacerbated by my theme, but fundamentally I think that some representation of the full-size preview image is not being freed. [21:44:16] stichnot: This is probably also exacerbated by the move to full-size preview images. [21:44:44] stichnot: Since it's causing embarrassing WAF issues, I'll probably start looking into it soon. [21:57:25] stichnot: In the meantime, I have a proof of concept of the Program Guide updating guide rows via helper thread DB queries with results sent by event to the UI thread for rendering. Next step is to do the same for the much more expensive channel status queries.